This post is sponsored by Lunchbox. All opinions and photos are 100% my own. 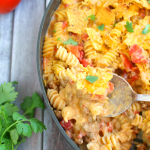 Need an easy, delicious dinner idea that everyone in the family will love? 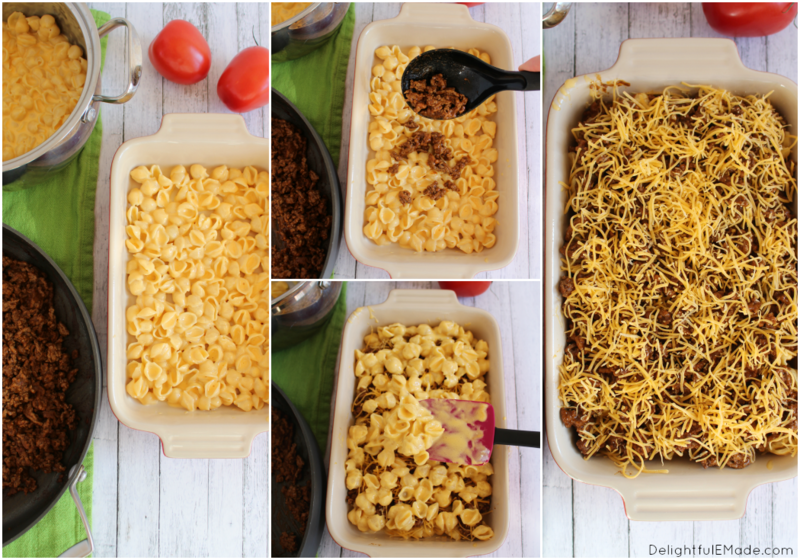 This easy Taco Bake is mac and cheese and tacos combined into one cheesy, delicious dinner! Perfect for Taco Tuesday or any other day of the week! With Christmas just days away, it seems like we’ve been going non-stop. Christmas plays, church events, and school parties are just a few of the things we’ve been scrambling to attend. I’m sure my family is not unlike yours in the fact that getting our family to gather around the table for a hot meal is like asking for a Christmas miracle, am I right? 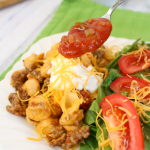 I’ve discovered this easy and delicious Kraft Taco Bake – it’s the perfect meal to get your family to the table. To actually sit down, have a conversation with one another and enjoy a wonderful meal with each other. 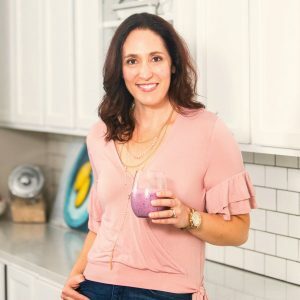 After all, the holidays are really about spending time with the one’s you love – getting to the dinner table is the perfect way to reconnect during the holiday craziness. 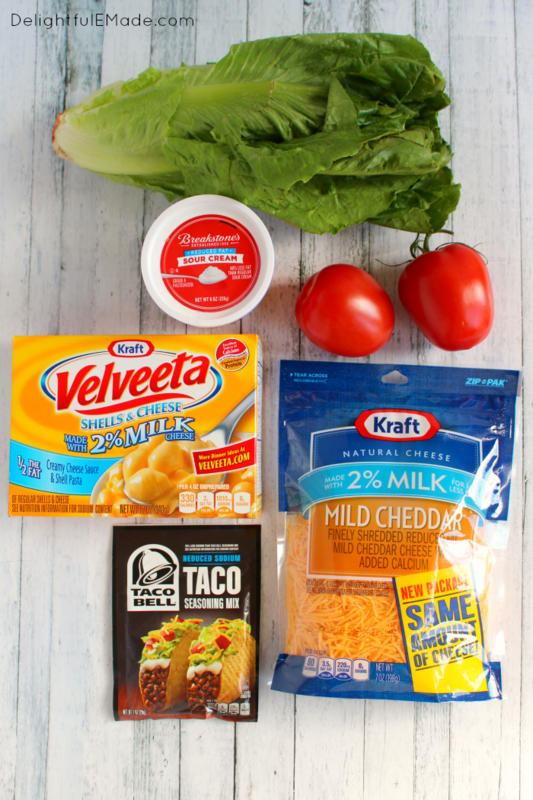 While getting groceries at Walmart, I made sure to pick up all of the essentials for this Kraft Taco Bake. You’ll need Kraft Deluxe Macaroni & Cheese Dinner Made with 2% Milk Cheese, TACO BELL® Reduced Sodium Taco Seasoning Mix, BREAKSTONE’S Reduced Fat Sour Cream, KRAFT 2% Milk Shredded Cheddar Cheese, and TACO BELL® Thick & Chunky Salsa. You’ll also need 1 lb. lean ground beef. This delicious dinner comes together easily. You’ll start by simply preparing your KRAFT Macaroni and Cheese dinner according to the box directions. Once it’s done, you’ll mix in 3/4 cup of the BREAKSTONE’S Sour Cream. 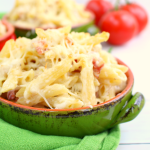 The mac and cheese comes out very creamy! 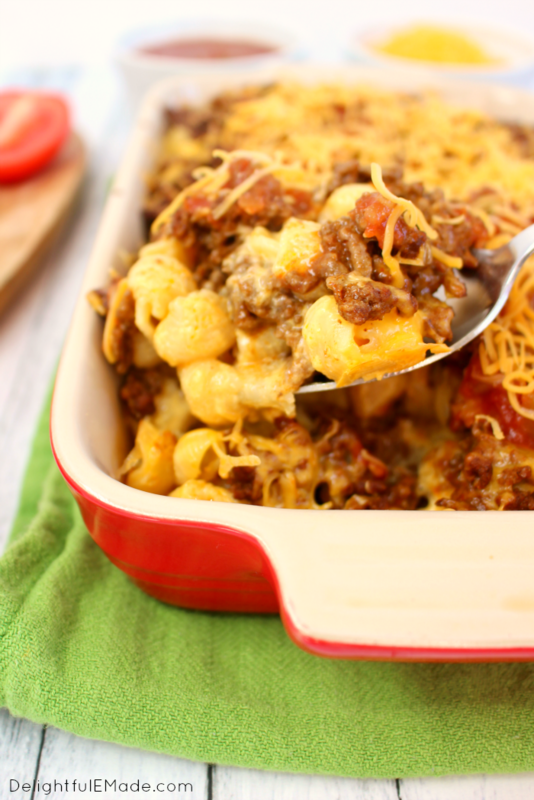 While the noodles are cooking, in a separate skillet, you’ll begin browning your ground beef. Once cooked, add the Taco Seasoning. 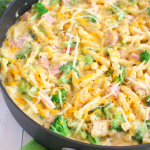 To a medium baking dish (sprayed with non-stick cooking spray), add about half of the Macaroni and Cheese. 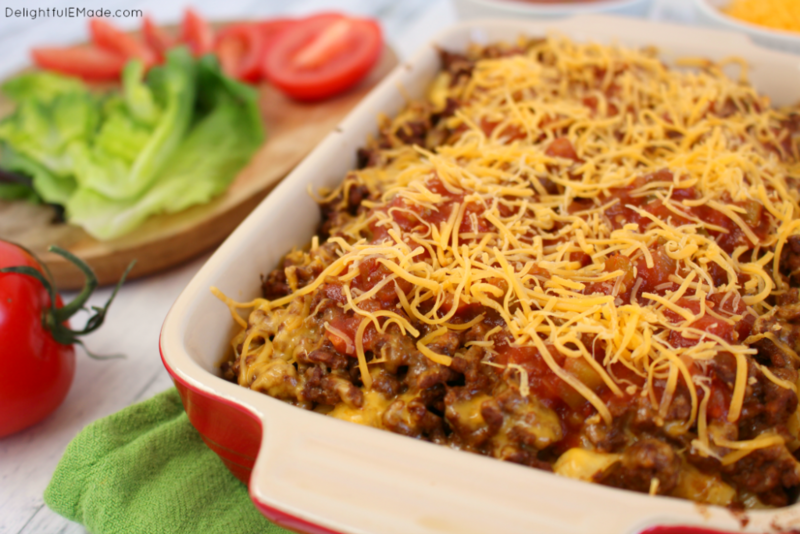 You’ll then layer on about half of the taco meat, and then add shredded cheese. You’ll then bake for about 15 minutes. Top with the remaining shredded cheese and salsa and bake for another 5 minutes. 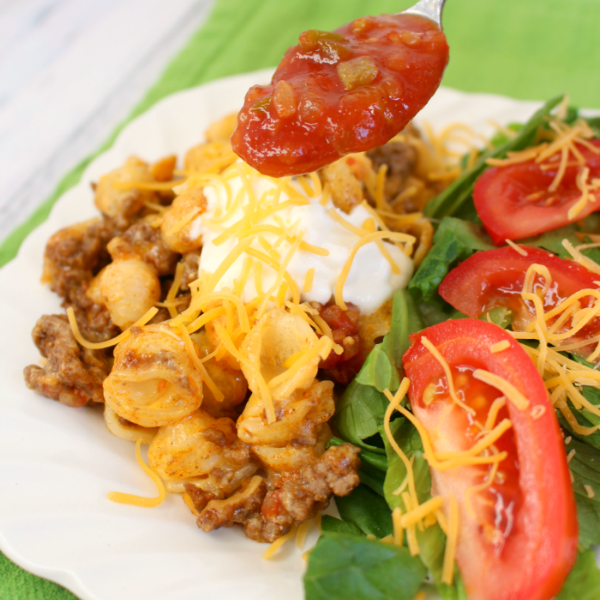 You’ll have the most amazing, hot, cheesy Taco Bake that everyone in the family will love! Serve up the Taco Bake with your favorite taco toppings, like lettuce, tomato, additional shredded cheese, sour cream and salsa. It’s also great with guacamole, too! Prepare Dinner as directed on package. While Macaroni is cooking, brown meat in skillet; drain. Stir in seasoning mix and water. Bring to boil; simmer on medium-low heat 10 min., stirring occasionally. Stir sour cream into prepared Dinner. 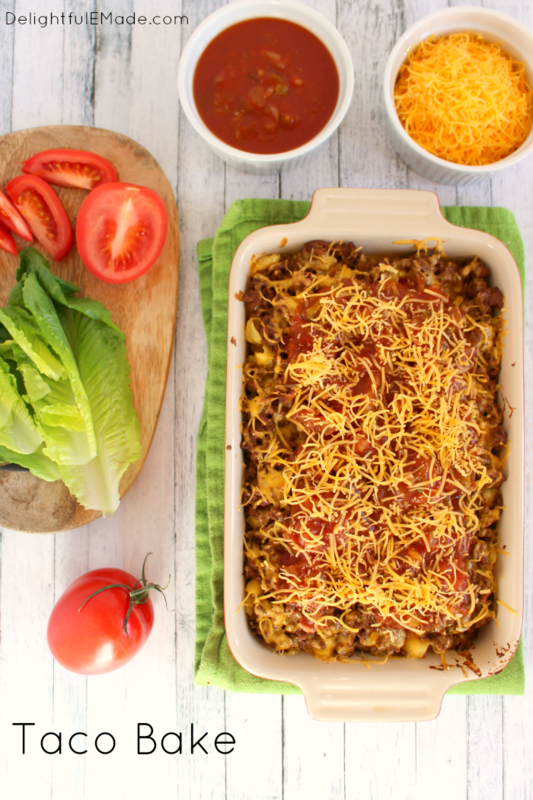 Spoon half the Dinner mixture into 8-inch square baking dish sprayed with cooking spray; top with layers of meat mixture, 1 cup shredded cheese and remaining Dinner mixture. Cover. 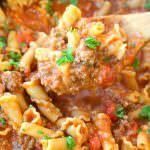 This recipe is from Kraft Recipes. 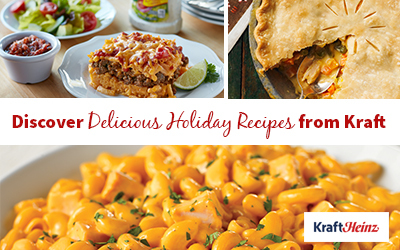 You can find this an many other fantastic dinner ideas and ways to celebrate the season here. Yum! 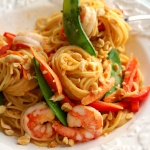 I will be making this for dinner tonight! 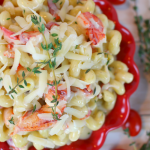 Definitely one the whole family would love - what a great dinner idea!